I’ve been mulling over this definition of a “boss” since finishing the book a few months ago. On one hand, it’s so simple! Imagine if these bullets topped the job description of every boss on the planet. Wouldn’t work be great!? And yet, I know firsthand how hard this is to do in practice. We manage people, not widgets, and that can get tricky fast. 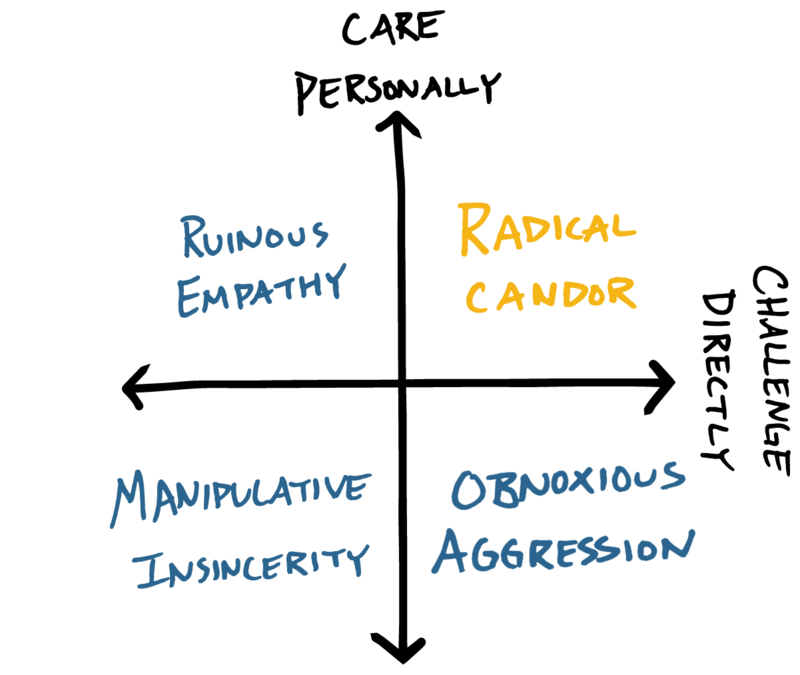 But if this at all sounds like the way you hope to lead your team, then Radical Candor is a great guide to using relationships, not power, to drive your success as a manager. The second axis is “Challenge Directly.” I liken it to the managerial mandate to provide great feedback, except turned up to 11. “The second dimension involves telling people when their work isn’t good enough — and when it is; when they are not going to get that new role they wanted, or when you’re going to hire a new boss “over” them; when the results don’t justify further investment in what they’re working on,” Scott says. As you adopt an approach of radical candor, Scott recommends mapping your feedback to the framework above with the help of your team. After you offer praise or criticism, ask the recipient where it landed in the quadrant. This shows you’re open to radically candid feedback as well, and also gives you an instant feedback loop for improvement. Scott recommends offering praise more often than criticism, but asserts that this has to be radically candid as well. A “good job,” though nice in the moment, can actually be vague and unhelpful. By offering specifics about what your report is doing well, you let them know you care personally and also showcase how they should operate in the future. Not everyone on your team is going to want a steep growth trajectory, but that doesn’t mean they won’t provide excellent performance. Scott recommends identifying if members of your team are seeking growth or stability, then cater opportunities accordingly. In almost any situation, a team needs individuals on both sides of this spectrum to succeed, though it’s easy as a manager to overlook team members interested in keeping things stable. Great bosses create what Scott calls a “culture of listening.” By taking time to listen to reports, you can shift your role to that of the editor — helping your team convey their thoughts more clearly and paving the way for new ideas to come from anywhere. If you find this helpful, consider picking up a copy of the book. And for the TLDR version of the ideas packed within, check out Kim Scott’s article on First Round Review. For more great takes on leadership and management delivered right to your inbox, sign up for the Manager Companion newsletter.